CBC and SundanceTV today announced casting for the dramatic eight-part miniseries UNSPEAKABLE, which chronicles the tainted blood scandal beginning in the 1980’s. Acclaimed actors Sarah Wayne Callies (Colony, The Walking Dead), Shawn Doyle (Bellevue, Big Love), Michael Shanks (Stargate SG-1, Saving Hope) and Camille Sullivan (The Disappearance, The Man in the High Castle) will lead the series. Production on UNSPEAKABLE begins spring 2018 in Vancouver, BC, for broadcast on CBC in Canada and SundanceTV in the U.S.
Sarah Wayne Callies has made an indelible impression on audiences worldwide by bringing complex and unique female characters to life on screen. She was recently seen in National Geographic’s miniseries The Long Road Home, opposite Michael Kelly, Kate Bosworth, Jason Ritter, and Noel Fisher. She also currently stars on USA’s drama series Colony, opposite Josh Holloway. In addition to her projects with NatGeo and USA, Callies recently starred in the season five reboot of FOX’s critically acclaimed series Prison Break. Another notable role held from 2010-13 was starring as Lori Grimes, on the internationally renowned, record breaking series The Walking Dead. On the film front, Callies most recently starred in This Is Your Death, alongside Josh Duhamel and Giancarlo Esposito, which premiered at the SXSW film festival in March 2017. She also recently appeared in Warner Brothers’ action-packed Into the Storm, directed by Steven Quale. Other feature credits include: The Other Side of the Door, Pay the Ghost, Black November, Whisper and Benoit Phillipon’s Lullaby for Pi; where she composed and performed an original song in addition to acting opposite Rupert Friend. 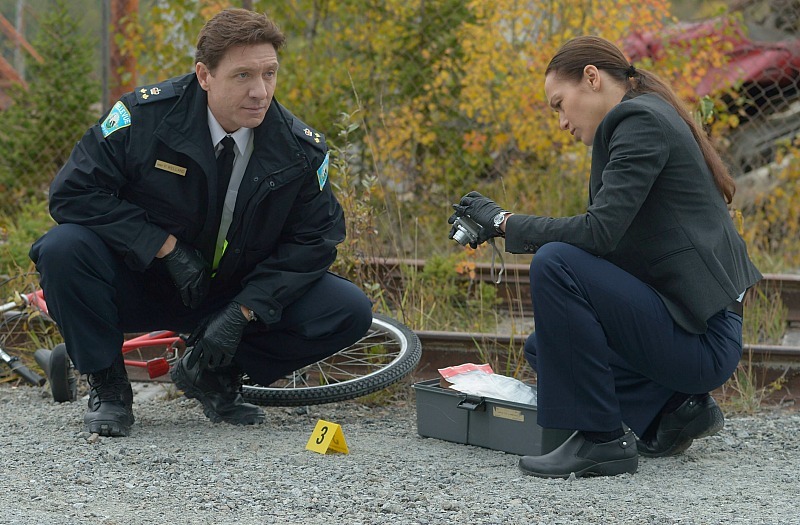 Shawn Doyle can currently be seen on WGN America starring opposite Anna Paquin in CBC’s Bellevue. He recently wrapped filming a role starring opposite Keon Alexander and Genevieve Kang in UCP’s Impulse for YouTube Red as well as season three of the SyFy series The Expanse, starring opposite Thomas Jane and Steven Strait. He can also be seen on TV starring opposite Jason Momoa in Netflix’s Frontier. He was last seen in theaters starring opposite Joanne Kelley and Jason Priestley in the independent film Away From Here, directed by Justin Simms. Shawn also starred in season three of the Emmy® nominated Netflix seriesHouse of Cards, as well as season one of Fargo and USA’s Covert Affairs. Shawn starred opposite Tatiana Maslany in the Sundance hit Grown Up Movie Star, and played “Joey” (Bill Paxton’s unlucky brother) in the critically acclaimed HBO show Big Love. Michael Shanks, after a decade-long stint as fan-favourite Dr. Daniel Jackson in sci-fi series Stargate SG-1, has gone on to star on several other hit series, TV movies, and films, including, most recently, the drama series Saving Hope which earned him a Leo Award for Best Lead Performance by a Male in a Dramatic Series in 2013. Shanks has also directed three episodes of the series, after making his directing debut in 2001, directing Stargate SG-1. Shanks appeared in a three-episode arc on the Emmy Award®-winning drama 24, and recurred on the hit series Smallville, as Carter Hall (a.k.a. Hawkman). Shanks played opposite Anne Archer in the made-for-TV movie Judicial Indiscretion, and portrayed the hockey legend Gordie Howe in Mr. Hockey: The Gordie Howe Story, a role which earned him a 2014 Leo Award for Best Lead Performance by a Male in a Television Movie, as well as a Canadian Screen Award nomination. His other television credits include a recurring role on Burn Notice and guest-starring roles on CSI: Miami, Stargate: Atlantis, Mr. Young, Endgame, Supernatural and more. He also co-starred in the Emmy Award®-winning William H. Macy telefilm Door to Door and the film adaptation of Jack London’s Call of the Wild. Camille Sullivan is an award-winning Canadian actress. Most recently, she was nominated for a 2018 Canadian Screen Award for her work on the miniseries The Disappearance. Sullivan has twice been nominated for Gemini Awards: once for her portrayal in the series lead role of Amy Lynch on Shattered, and then again for her portrayal of Francine Reardon in Chris Haddock’sIntelligence for CBC. She played a lead role in the drama pilot Mistresses, and other recent television credits include recurring roles on Man in the High Castle, Rookie Blue, Red Widow and Hellcats. She has guest starred on shows including Proof, Motive, Falling Skies, Combat Hospital, Alcatraz, Flashpoint and The Killing. Past film projects include the much lauded Ally Was Screaming for which she won the UBCP/ACTRA Best Actress Award for her stunning performance. Sullivan was also luminous opposite Gabrielle Rose in the heartbreaking film Birdwatcher for which she garnered another UBCP/ACTRA Best Actress Award. Another lead credit includes Carl Bessai’s multiple award-winning dramatic feature film, Normal. Her performance in Normal won her a Leo Award for Best Actress in a Feature Length Film. Other starring roles include Mount Pleasant, written and directed by Ross Weber, Mothers and Daughters, an improvised film directed by Carl Bessai for which she earned another LEO nomination. Sullivan also appeared in Bessai’s Fathers and Sons and now completes the set with Sisters and Brothers.